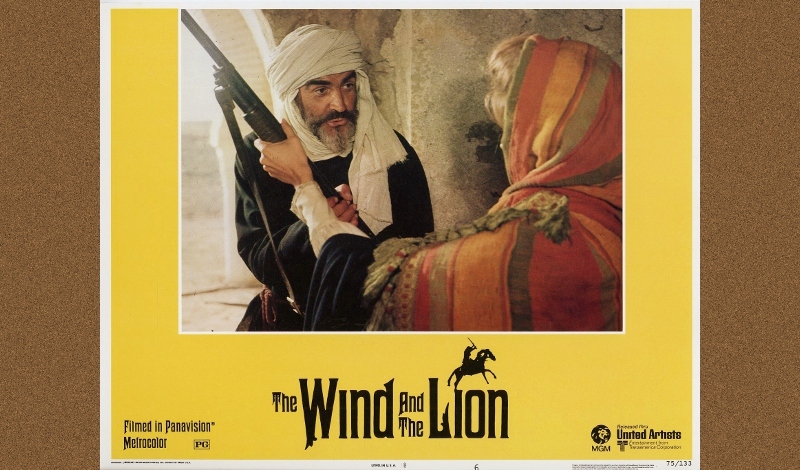 Though only the second directorial effort from John Milius (Conan the Barbarian, Red Dawn), 1975's The Wind and the Lion remains a confident, ambitious and entertaining combination of historical drama and creative license. Sean Connery stars as Mulay Achmed Mohammed el-Raisuli the Magnificent, sherif of the Riffian Berbers...or just plain "Raisuli", if you're in a rush. His Moroccan raiding party kidnaps an American expatriate, Eden Pedecaris (Candice Bergen) and her two children, William and Jennifer, in an attempt to disrespect the ineffective Sultan Abdelaziz (Marc Zuber). Meanwhile, President Teddy Roosevelt (Brian Keith) uses the kidnapping to bolster his "Big Stick" policy and upcoming 1904 re-election campaign. Not surprisingly, The Wind and the Lion's international intrigue gives it a "big picture" mentality, but the head-butting relationship between Raisuli and his feisty captive adds another layer of interest to the adventure. Connery's performance as Raisuli is a highlight and doubles as an interesting turn from his previous involvement in the James Bond franchise and his red, shiny appearance in the previous year's Zardoz. The blind casting of Connery (not to mention that 99% of the spoken dialogue is English) may feel awkward at first, but Milius' formula gels quickly and settles into a nice groove during the film's surprisingly brisk 119-minute lifespan. Raisuli serves as a terrific foil for the spunky Pedecaris ("You're a great deal of trouble!") and their initial friction provides many of the film's most memorable exchanges. Brian Keith's rugged, confident portrayal of "T.R." is another highlight, serving up more than enough swagger and charisma to channel the popular two-time President. Though Raisuli, Pedecaris and Roosevelt never meet face-to-face, their paths meet at interesting turns and serve as anchors for The Wind and the Lion's character-driven plot. Not all of the film's strength's lie in its characters, however. Milius' story, very loosely based on the Perdicaris Incident of 1904, provides an accessible backdrop for this multi-layered adventure, while the terrific battle sequences are nearly as violent as Conan. Machine guns, cannons, shotguns, swords and more are the tools of the trade, while top-notch stunt work and smart editing cement these action set-pieces as some of the decade's very best. Other inspiration was drawn from David Lean epics like Lawrence of Arabia, Sam Peckinpah's The Wild Bunch and even the stories of celebrated English author Rudyard Kipling. The production design by Gil Parrondo uses Spanish locations to great effect, while the energetic, swashbuckling score by Jerry Goldsmith is yet another feather in the famed composer's cap. Warner Archives' new Blu-ray package of The Wind and the Lion aims to overtake their own 2004 DVD and, despite that previous edition's modest strengths, it's no contest in the A/V department. This terrific 1080p transfer and the accompanying DTS-HD 5.1 Master Audio track easily boost the film's effectiveness, especially during the film's chaotic, bloody battle sequences. As for the bonus features...well, nothing new is included, but nothing has been lost either. Much like its parent company, Warner Archives has established a reputation for serving up quality transfers and The Wind and the Lion is no exception. Framed at 2.35:1, this 1080p transfer easily outpaces the already strong presentation of the 2004 DVD. Image detail and textures are uniformly strong, colors are evenly saturated, no excessive digital manipulation could be spotted and a modest layer of grain maintains the film-like quality throughout. It's not surprising that a generally high-profile production largely shot outdoors under natural light, not to mention lensed by Billy Williams (Gandhi), looks this good...but old and new fans alike should be thrilled with this transfer nonetheless. DISCLAIMER: This review's compressed, resized screen captures are strictly decorative and do not represent Blu-Ray's native 1080p resolution. It's not a consistently bombastic experience, but this DTS-HD 5.1 Master Audio track (based on the original 70mm release six-track mix) opens up nicely at times, certainly more than expected for a 1975 picture. Jerry Goldsmith's score also fares well from start to finish, while most of the dialogue is anchored squarely up front. The sporadic battle sequences hit hard (especially during the third act) and bustling crowd sequences also feature several hints of rear channel ambiance. The only anomalies I could pick up were a few mild echoes during certain outdoor conversations, but this is probably due to the original ADR and not the actual post-production mix. Any way you slice it, first-time viewers will be thoroughly impressed and those revisiting The Wind and the Lion will appreciate the extra punch and careful attention to sonic detail. Just for the record, optional English SDH subtitles are included during the main feature only. Though predictably low on style points, Warner Bros.' standard interface is clean, easy to navigate and loads quickly. Sub-menus have been included for extras and subtitle setup, but not chapter selection. This dual-layered, region-free disc is housed in a silly "eco-friendly" case with basic disc artwork and a cover image similar to the 2004 DVD. Again, everything from the 2004 DVD. These recycled supplements include an Audio Commentary with Writer/Director John Milius, a brief Behind-the-Scenes Featurette with cast and crew input, plus a partially complete Theatrical Trailer. This is all interesting material, but it's a shame that nothing new was offered for its (almost) 40th anniversary. The Wind and the Lion certainly has a lot going for it: plenty of talent behind (and in front of) the camera, an ambitious scope, an engaging story, terrific production design, hard-hitting action and even a nice little dose of humor. First-time viewers will be mighty impressed. The film's 40th anniversary is almost here and, while The Wind and the Lion hardly feels that old, in many ways it also fits in nicely with historical epics from decades earlier. Sean Connery and Candice Bergen's lead performances are career highlights and Brian Keith holds his own as good old "T.R.". Warner Bros' "Archive Collection" release of The Wind and the Lion should please long-time fans, serving up a top-notch A/V presentation and a handful of recycled but informative extras. It's priced a bit higher than recent Warner catalog titles like Get Carter and Conspiracy Theory but worth picking up as a blind buy or upgrade from the 2004 DVD. Highly Recommended.